In the game of thrones, you either win or you fall into a gap in the ground. I feel like this is basically what the “Beyond the Wall” episode was like. 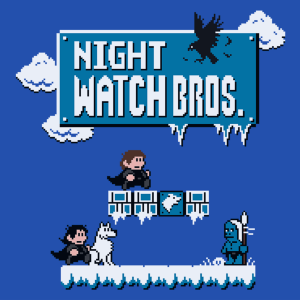 They weren’t all Night Watch, but they all walked along the ice and faced Wights like they were video game baddies. And they even had gaps in the ground to fall in. Ya know what, this is something I hadn’t considered before. Maybe Game of Thrones would make a good video game. The princess is always in another castle. The baddies go down easily with certain weapons but are otherwise unkillable. Or maybe it’s only good enough to make a smarmy reference on an obscure T-shirt. Who knows. In either case, that T-shirt exists! Go get it!